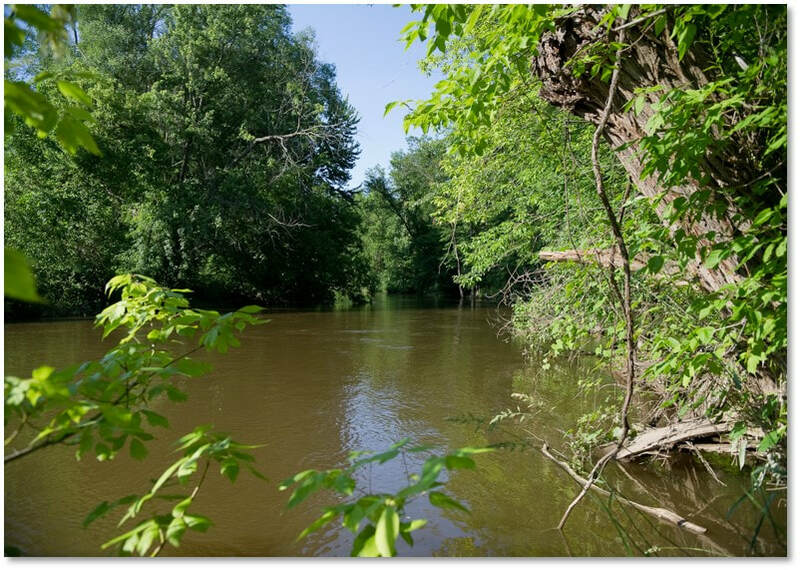 ​Along the banks of the Chippewa River, a small piece of land was purchased by Peter and Cameron Szok with the intent to donate the property to the Chippewa Watershed Conservancy as a resource to the community. The 3.4-acre piece of property has roughly 1,000 feet of frontage on the Chippewa River and will serve as a key entrance point to the river. “The Stephen and Agnes Szok Riverbend Preserve would provide a much needed place of entry between Mt. Pleasant’s Island Park and Geneva Road,” Peter Szok states in a letter to Little Forks. Prior to donating the property to the Chippewa Watershed Conservancy, Peter and Cameron Szok worked with Little Forks Conservancy to develop a conservation easement for the property to ensure the land will be protected while allowing for future river access. This provided a unique opportunity for Little Forks Conservancy to strengthen a valuable partnership with the Chippewa Watershed Conservancy, protect and improve a vital waterway, and establish a lasting relationship with the Szok family – who had previously donated Peter’s parents’ property to Little Forks, one of the organization’s five publicly accessible nature preserves. “I could never have envisaged the network of well-used parks, paths, and preserves which now dot many parts of the watershed and which add so much to residents’ quality of life,” expressed Peter Szok. Lipschitz, Director of Land Conservation. Little Forks will work closely with Chippewa Watershed Conservancy to create a safe launch area for kayakers and canoeists. “We were delighted to work with Peter on another successful conservation project. The Stephen and Agnes Szok Riverbend Preserve protects over 1,000 feet of scenic Chippewa River riparian corridor and supports a surprising amount of biodiversity given its size. The location of this nature preserve is strategic as it will serve as an important public access location for activities such as paddling, fishing and wildlife viewing, opening up an entire section of the river that is currently underutilized. 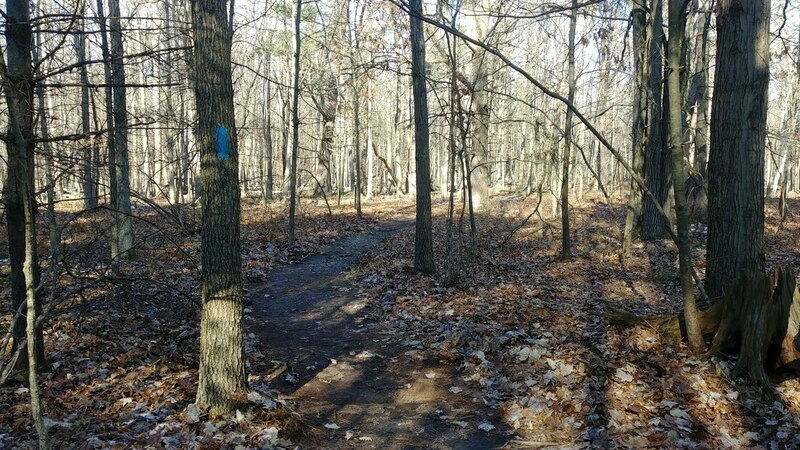 The conservation easement held on the property by our partners at The Little Forks Conservancy will ensure an additional layer of protection on this important natural area,” stated Jon Breithaupt, Executive Director at Chippewa Watershed Conservancy. 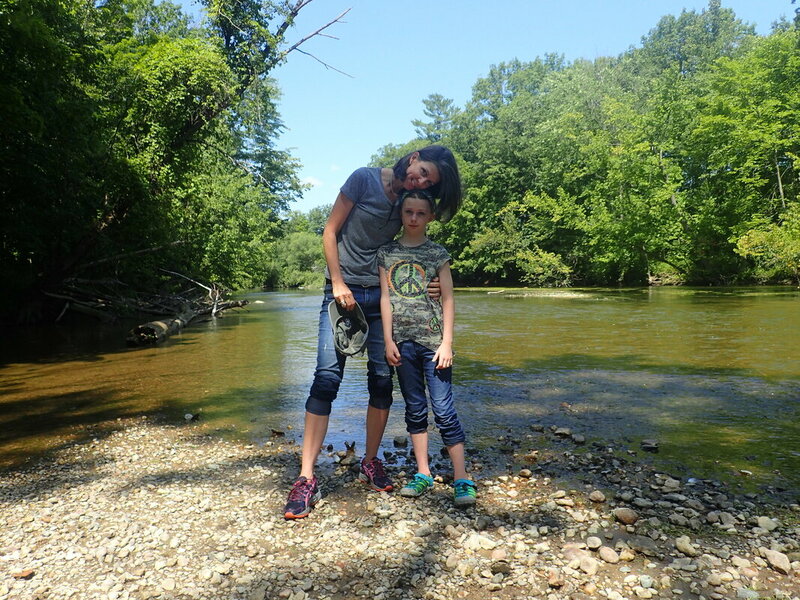 “Peter and Cameron’s dedication to protecting natural areas and sharing with the mid-Michigan community the opportunity to access these special places is remarkable. It speaks volumes to their commitment to conservation,” commented Greg Yankee, Executive Director. ​and ice that covers even the boardwalks. ​​Trail Blazes can come in a variety of colors; but there will only be one color per trail so a different color will indicate a new trail. Generally in the shape of a rectangles, blazes are painted on trees and the arrangement of these blazes indicate direction of the trail. 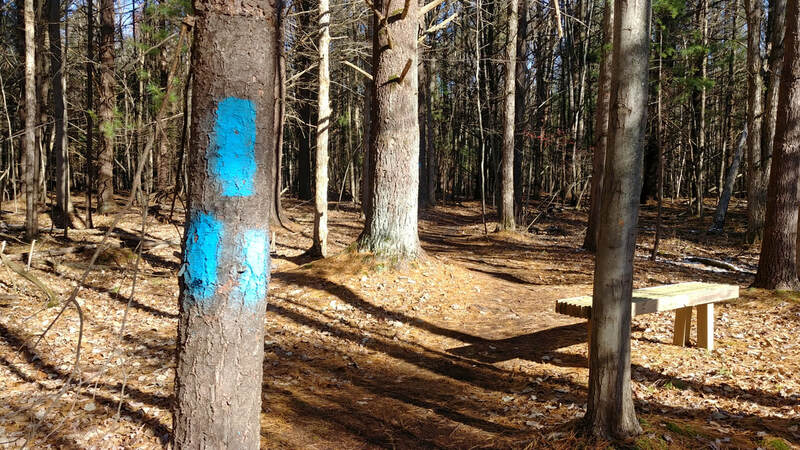 On Little Forks’ Preserve trails are marked with Blue, Yellow or Green. While standing next to a blazed tree you should be able to see the next blaze from that spot to indicate the established path. Right Turn and Left turn blazes are used when there is a sharper turn, but the next blaze should be shortly after the turn. If two trails overlap, you will find two rectangles one of each color with one directly above the other; not offset like the turn blazes. Blazes are beneficial for knowing your location while hiking. If you happen to get turned around noting the color to the trail you are on will narrow down the possibilities for people to find you or to convey directions on how to get to the parking area. For your safety and the preservation of the natural areas, we urge you to use these trail blazes and stay on the trails. Farmland for sale - Bid Closed! The Conservancy has decided to place approximately 100 acres of the farmland at Riverview Natural Area for sale under a conservation easement. This farmland has been leased to local farmers in previous years, by selling this land with a conservation easement allows us to continue to protect the natural and agricultural heritage of the land while focusing our resources on the rest of Riverview, the other four preserves open to the public, as well as new projects. We are looking for conservation-minded potential buyers to participate in a closed bid process. If you are interested in obtaining a bid packet, please click here – Farmland Sale Bid Packet. Bids are due by noon on January 9, 2019.
can i hike during hunting season? Fall is a gorgeous time to explore Little Forks Conservancy’s nature preserves. You can enjoy the last lingering autumn leaves. You may also see wildlife like porcupines more easily. Many people cut back on hiking during this time because of hunting season. But, hiking during hunting season can be just as enjoyable as any other time of year! Here are a few tips to help you discover our trails in the fall. 1. When is hunting season? Although many of us are most familiar with deer hunting season, there are actually a number of hunting seasons in Michigan. You can see the full list of hunting season dates by clicking here. 2. Is there hunting on the preserves? Little Forks Conservancy does not allow hunting on any of our Midland County preserves currently. That means you can enjoy hiking at the Averill Preserve, Forestview Natural Area, and Riverview Natural Area. However, the Albert and Virginia Szok Preserve is located within Pine Haven Recreation Area which does allow hunting. If you’re planning on visiting the Szok Preserve, please be aware that hunting may be occurring in the area. Our new preserve in Gladwin County has bow hunting only. Contact the office for an application. 3. Is there hunting nearby at the other preserves? Yes, some of our neighbors do hunt their properties. For your safety, please stay on the trail and obey any “No Trespassing” signs. Also, please respect neighboring hunters by minimizing loud noises or disturbing wildlife. 4. Do I have to wear orange? Wearing a bright orange hat or vest is a great way to make sure you’re seen by hunters! Since they wear it themselves, they will know that means you’re there. If you’re walking your dog, make sure he or she remains on a leash – and you can also pick up an orange vest for your dog at local pet supply stores! If you’re out during dawn or dusk when light is dim, a headlamp or flashlight is also recommended. 5. What if I encounter a hunter? If you see a hunter on a Little Forks Conservancy preserve, contact our office at 989.835.4886. You may see hunters along the preserve boundary. If you do, quietly continue along the trail within the preserve. If you follow these tips, you should be able to safely enjoy a great hike at one of Little Forks’ preserves! If you encounter any problems or if you have any questions, please feel free to contact our office at 989.835.4886 or email Sara. In partnership with the AmeriCorps program, we are able to offer an exciting position that will work to improve and protect the health of our region’s land and water. We are seeking an individual to assist with the Conservancy’s land stewardship program collaborating with landowners and at our nature preserves. We will be looking for someone who is self-motivated, knowledgeable in GPS and GIS, is able to manage multiple tasks, communicate well through public speaking and writing, and has a background in natural resources. Huron Pines AmeriCorps member Ted learning to be a stream leader for our biannual stream sampling event. Coordinating the MiCorps Stream Monitoring Program in the Spring and Fall. Map and remove invasive species through chemical and physical treatments. Monitoring at least fifteen conservation easements. Coordinating a Cedar River Clean up in late summer. Oversee volunteers assisting in stewardship activities at the nature preserves. Implement community conservation programs such as Conservation@Home. An opportunity to join others with dedication, passion, and enthusiasm for the environment and for national service. Develop real-world skills, increase your experiences and have the opportunity to network with other resource professionals. Educational award in the amount of $6,095. Loan forbearance of qualified federal student loans during the term of service. Living stipend totaling $13,732 (distributed bi-weekly; this is taxable income). All applications must be in by September 28th, 2018. Interviews will take place on November 8 and 9, 2018 in Gaylord, MI. This year we are taking some time to get out into the preserves with the community. Whether it is to learn about a creature or plant in the preserve or to share the unique beauty of each preserve with community members. May 17th 6:00pm — Wildflowers at Szok with Chippewa Nature Center- join Interpretive Naturalist Jeanne Henderson from the Chippewa Nature Center for a hike to observe the native wildflowers! May 24th 5:00pm — Vernal Pool Hike at Riverview Natural Area with Sara – Join Sara at Riverview to hike the first loop and explore the vernal pools near the trail. Sara will go into the importance of the vernal pools and which animals rely on them to survive. Wear waterproof boots. June 19th 6:30pm — Dog Hike at Riverview Natural Area – Meet Little Forks Staff members and their dogs! We invite community members to have a puppy play date and hike through Riverview. We ask to keep dogs on a leash during this hike. People without dogs are welcome to join as well. June 28th 7:00pm — Sunset Hike and Campfire with AmeriCorps Member Ted at Riverview Natural Area – Meet Ted at the Riverview north entrance off of 5 Mile Road where he will lead a hike near sunset and end with a campfire where he will share stories of backpacking adventures and others are welcome to share their adventure stories with the group. Bring a chair/blanket, flash light or headlamp. July 19th 6:30pm — Senior Services Social at Averill Preserve with Andrea- Join Senior Services and Little Forks Conservancy for a walk along the new trail. Contact Andrea for more details. July 21st 10:30am — Salamander Hike at Riverview Natural Area with Interpretive Naturalist Michelle Fournier from the Chippewa Nature Center to look under logs and learn how to use the app Herp Atlas! July 25th 5:00pm — Averill Preserve Hike – Join Little Forks Staff to see the completed all access path and all the new features. 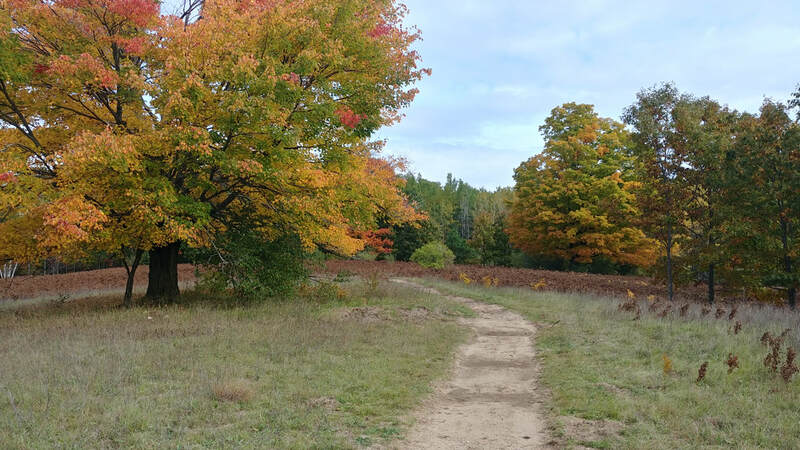 September 13th 6:00pm — Tour the New Preserve in Gladwin County! – Come take a look at the newest preserve at Little Forks Conservancy. A staff member will show you the progress so far and what to look forward to in the coming years. October 19th 5:00pm — Fall Color Hike at Forestview Natural Area- As the weather cools off, join us at Forestview to take in all the fall foliage. Little Forks hopes the entire community will get out to the preserves for at least one of these hikes and finds something new to enjoy right outside of the city. Little Forks’ Stewardship Coordinator, Sara, is excited to expand the workshop series she started last year as an AmeriCorps member. This summer we will provide four workshops covering a variety of topics that were chosen based on a survey sent around to volunteers. Leave No Trace/Backpacking-AmeriCorps member Ted will go over the 7 concepts of Leave No Trace and discuss backpacking tips and tricks he has learned from his personal experience while hiking the Appalachian Trail. Michigan Bats and Diseases—Sara will go through nine species of bats in Michigan, problems they face such as habitat loss and disease followed by some things you can do to help. ​Stream Sampling 101-Learn how to monitor a stream and determine stream health. We will go over protocol at the office and take a field trip to practice sampling – By participating, you can be a Stream Leader or Collector in our biannual stream sampling of the Cedar River. ​Forest Management —Join Forester Nia at our new Gladwin Preserve to talk about managing a property for specific habitat.—more details soon! Americorps: Why do you care about the environment? Hello! My name is Ted and I’m the newest blog poster (and Land Steward) here at Little Forks. 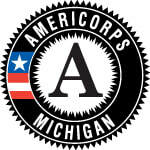 I come to Little Forks through the Huron Pines AmeriCorps program, which provides service members to more than a dozen organizations and government offices in Michigan. Coming to Little Forks and Michigan has been quite the experience– there are so many new people to meet and places to learn about. There are times when everything seems different, and that can be disorienting. I always find reassurance, however, in knowing that I have something extremely important in common with folks here at Little Forks. Even you, no matter who you are out there reading this post, most likely share this tenet: we care about the environment! So it makes sense to begin my introduction with our commonality: why I care about the health of our planet. For me it began growing up in Newington, Connecticut, a suburb of Hartford. My childhood was spent building boats with my friends on Piper Brook (turns out all you need is plywood and caulk…lots of caulk), going for hikes on the Metacomet Trail with my dad (or “forced marches” as my brother and I affectionately called them), and making a yearly pilgrimage with my mom and cousins to Nickerson State Park on the Cape. I went to college at Clark University in Worcester, Massachusetts, and spent the spring and summer of my junior year thru-hiking the Appalachian Trail (yes I got credit and yes I received a stipend for the project. Clark is amazing!). What blew me away on the hike (besides the endless panoramic views) was that the 2,000+ miles of trail I walked was on unbroken conservation land. I spent an extra year at school digging deeper into conservation, writing a research paper about land management strategies in Worcester. Through all of these experiences I have developed an affinity for our natural world that extends beyond the science of biodiversity or carbon sequestration. For me, the objective need for good stewardship of our Earth has lined up with a deep personal relationship. I’m pretty sure that those two ingredients combine to make something called passion! Anyways, I arrive here in Midland, ready to learn the ins and outs of Michigan (c’s that sound like w’s? Driving 72 mph is slow? ), and pursue my passion with a year of service at Little Forks! I’ll finish by asking you the question I’ve asked myself in this post: why do you care about the environment, and why do you support Little Forks?